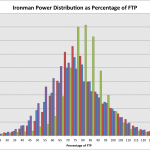 Bike pacing is such a pivotal part of Ironman performance I’m returning to the topic again. It’s difficult to correctly judge and evaluate pacing recent discussions have convinced me many athletes don’t understand or ironman pacing well. You finish the bike feeling fine, but if you’ve pushed too hard the impact on the run is devastating. 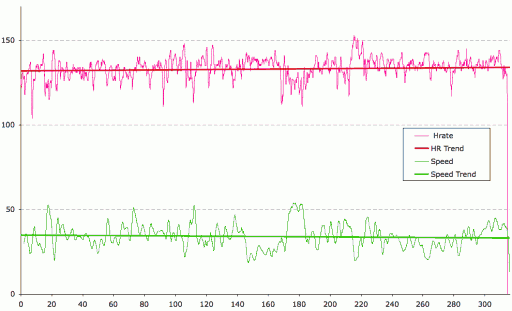 Bike pacing – more than likely the bike was just too hard. Run fitness – very occasionally it’s simply inadequate run fitness for the goal pace. It’s important to remember the relationship of pace and endurance. The harder the intensity of work the shorter the duration you can sustain it. You know the duration of an Ironman and all pacing choices need to ensure you can sustain that intensity for this time. 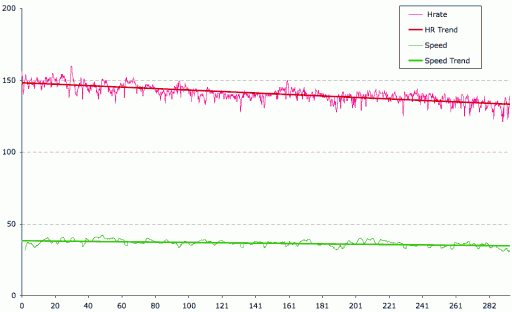 Whilst you may have marginal declines in effort the best races come when these are minimised. The Ironman bike needs to be a stable transition from swim to run. You’re looking to keep perceived exertion, heart rate and power quite controlled. Inevitable you’ll experience some fatigue, but with correct pacing there should be minimal negative impact. 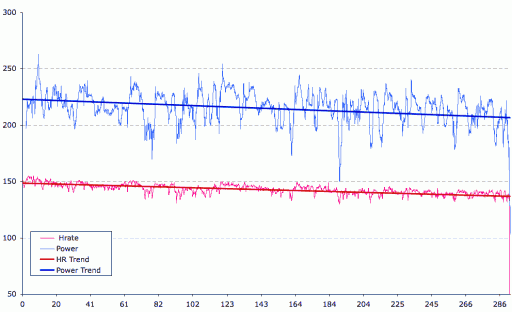 A useful concept for understanding pacing is aerobic decoupling the relationship between heart rate and power or pace. As fatigue grows the heart rate required for a given level of exertion rises. 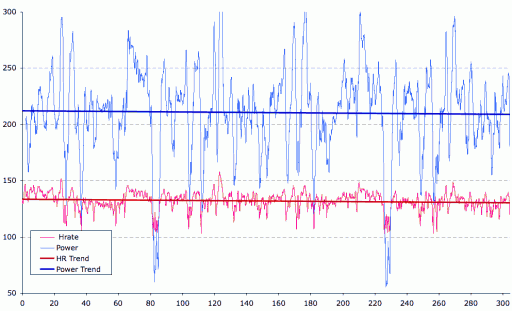 Aerobic decoupling expresses the degree of change over a ride, the fitter the individual the smaller the change in heart rate. If the initial pace is a suitable aerobic percentage of threshold the resulting change in heart rate should remain small. If you see a significant increase in heart rate for the same power or exertion it’s a sign you were working too hard. 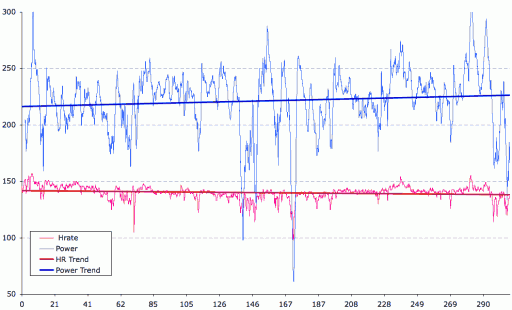 Similarly a drop in power or exertion for a heart rate is effectively the same situation. What you’re looking for is heart rate and exertion to remain largely in line with themselves. Achieve that and there’s a good chance you’ve paced your bike well. Considering averages and overall trends can hide certain issues. Whilst a stable heart rate and effort level is ideal terrain, climate and fellow competitors can all change the nature of a course. There are bound to be periods where you’re working harder or easier than planned. Moments above your Ironman pace are expected, but the key is to manage and minimise them. Spend too long or go too far above the appropriate effort level and the impact will is the same. 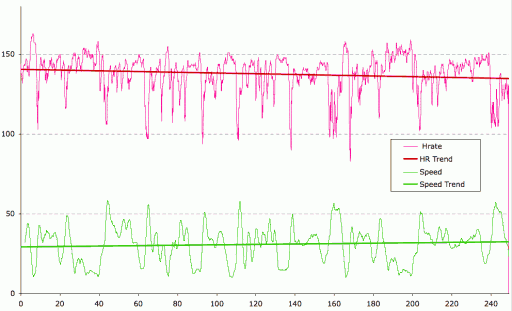 Excessive surges can significant hit fatigue and reserves effectively further limiting race pace. You need to monitor and control how hard you push when it comes to challenging conditions. It may make sense to push a little harder, but it’s important you don’t take yourself well outside your race pace. The longer you spend above your ideal Ironman bike pace the more challenging the run becomes. 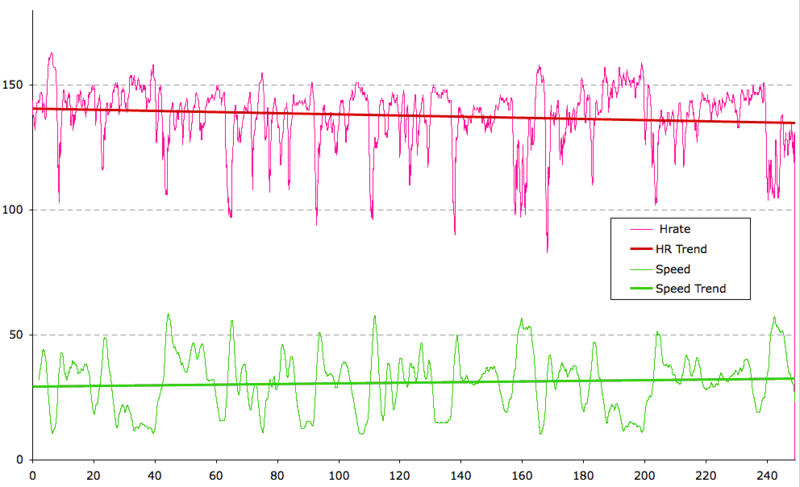 I’ve produced a few heart rate and power/pace graphs from my previous races to help illustrate some of these points. 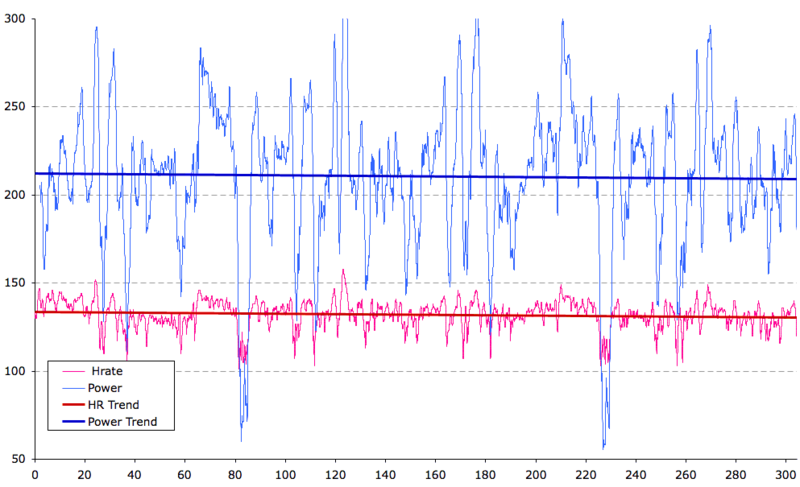 Overall it looks like my pacing wasn’t too bad in my first Ironman. 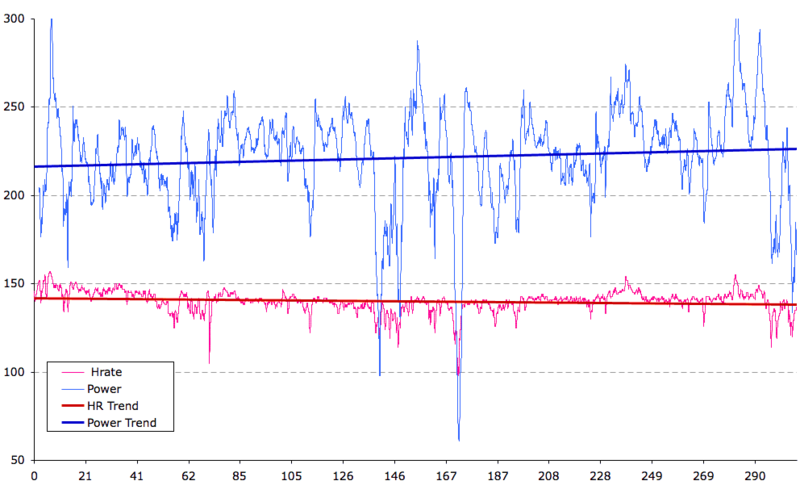 Power and heart rate trend together dropping slightly. It’s clear I struggled to sustain the power on the second lap and notably there’s a significant drop in the last half hour. This probably relates to periods of higher heart rate in the preceding hour when I was working hard trying to lose a drafter. The run that followed was a disaster in many respects. In part I believe I went slightly harder than I should have on the bike and also had that fade at the end, but also I fell into run pacing and nutrition errors. Running three hour marathon pace and not eating enough does not make for a good run. A chance to compare and contrast on the same course all be it with slightly different conditions. In 2008 I had a good all round race and felt I’d performed well for my level of fitness. Heart rate drops, but pace remains largely constant. I went out a little hard, but fortunately pulled that in quickly so the impact was minimal overall. Then in 2009 I’ve the advantage of power. There’s a clear coupling between the two, though an unfortunate decline in power. I definitely went out too hard and know that I struggled to maintain the intensity as the laps went on. There’s a notable fall off in power during the last 20 minutes. 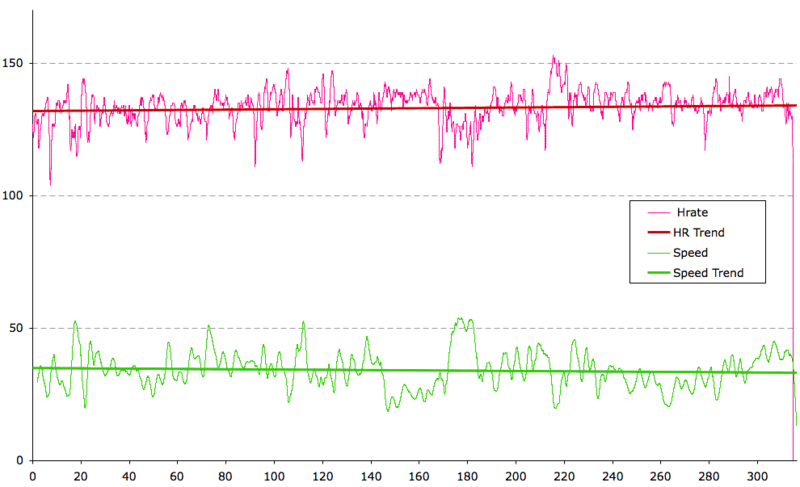 The general trend hides the fact I’d pushed too hard at points earlier in the race. Whilst I’ve spoken of maintaining a consistent power I didn’t pay much attention in Roth. I was in great shape and those power spikes had minimal impact on my heart rate. Roth was a solid training day and I ran well off the back of a bike with a lower average heart rate and power than I might anticipate. Whilst I’d had moments pushing too hard they’d been short-lived and part of a generally easier ride. What the two flat lines don’t express is the last two hours in Kona were spent riding into a headwind. To sustain that pacing required harder work on the return. This lines up with my feeling that I under performed in the first half of the bike. It’s one of the rare occasions I elevated my heart rate as the race goes on. I ran well off the back of this ride though did have a brief low patch about four miles in. I had a good day in Taupo and felt it was one of my better bikes. This shows with the rise in power over the ride. Heart rate largely remains consistent whilst exertion increases. Just like Kona I felt I under performed early on and came into my own on the second lap. 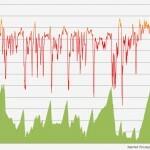 The return leg was into a headwind which helped keep the power numbers up. 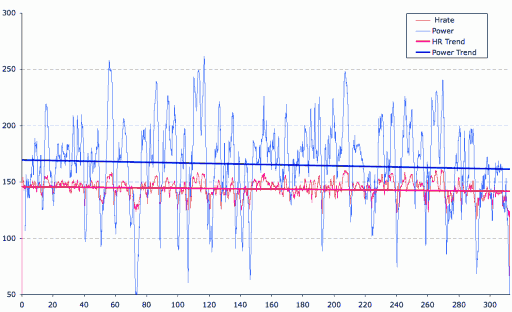 Notably all my racing in 2010 shows a similar pattern of initially not quite hitting the levels I want with an increase in exertion during the second half of the ride. It can be a frustrating experience as I’ll be passed in the first half, but generally take back places later on. How well I run seems to come down to weight and run fitness after this. 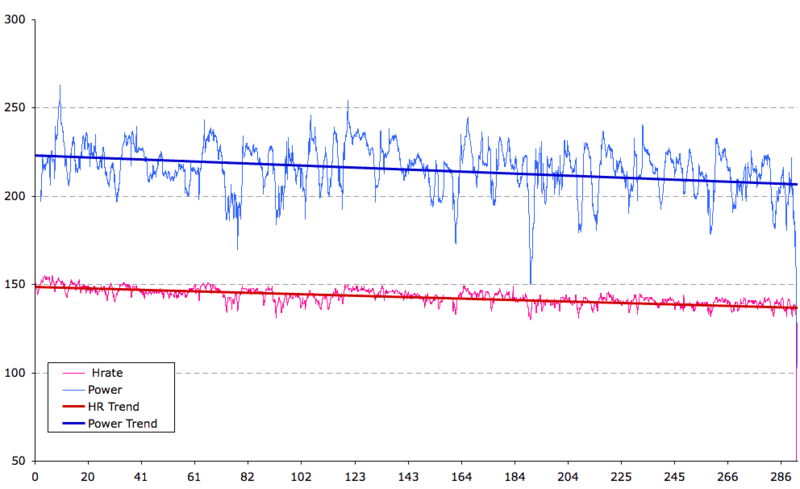 A final graph from a very different course with a continual stream of challenging hills. This made it difficult to stick to any kind of pacing strategy and my approach was to cap my heart rate on the first lap. I then aimed to push harder on lap two and I think you can see that whilst heart rate is declining overall there are solid periods of work. I may not have achieved the highest speeds of lap one, but I was consistently working at a higher pace over the course. 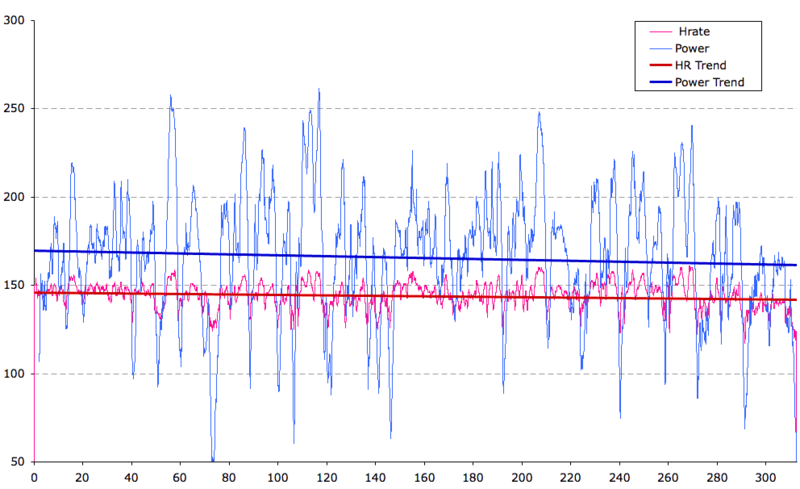 Variability in conditions and courses can make it hard to judge the correct pacing for an Ironman. My graphs show the variety of approaches and how well they worked. In some cases I seem to have broken some of my own guidelines (Roth) and yet ran well. When planning your Ironman pacing strategy it’s worth taking the time to look at your previous races or key training sessions to see how you paced them. Global trends and aerobic decoupling will give an idea how you handle the effort, but also look at the details. Periods of over-exertion can have significant impact without changing the averages much. Check for that drop off in the last hour too, it can be a sign you’ve over cooked things. Ultimately you want to be well informed and clear in your approach on race day. Keeping controlled and smart will help ensure a good bike performance. 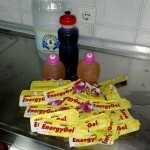 Then with good nutrition and a sensible run strategy to follow all should go well.